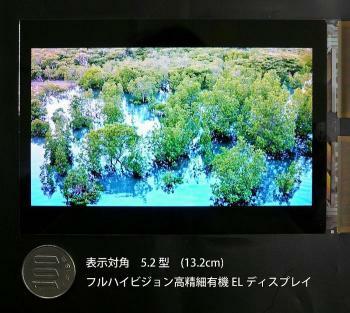 Japan Display developed a new 5.2" Full-HD (423 ppi) OLED panel, using an WRGB structure and an LTPS backplane. It seems that JDI is advancing quickly in their OLED program, this comes just four months after JDI announced a 4.5" 1280x720 (326 ppi) panel. Back then JDI said they plan to start producing AMOLEDs by 2014. This is quite an achievement by JDI. Just to compare, Samsung's highest resolution OLED panel, the 4.99" FHD one used in the GS4 has a ppi of 441, but it uses a Pentile matrix.